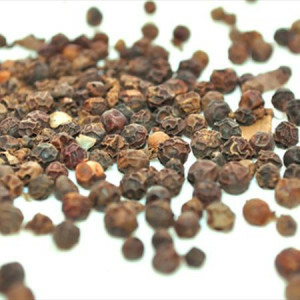 Adding flavor to cuisines of all nations, black pepper is the most widely produced and popular spice in the world. The small, round black balls we know as peppercorns are actually the berries of the plant Piper Nigrum. Harvested when half-ripe, these berries are allowed to ferment and dry in the sun until they shrivel and turn a brownish-black color. They have a hot, piney flavor that stimulates the taste buds. With so many culinary purposes, black pepper has long been a cherished spice. In ancient Greece, pepper was held in such high regard it was not only used as a seasoning, but as a currency and sacred offering to the gods. When the Visigoths captured Rome in 410 A.D., they demanded 3,000 pounds of pepper as ransom. And in the middle ages, the wealth of a man could be measured by his stockpile of pepper. Weighing it like gold, Europeans used it to pay rent, dowries and taxes. By the 15th century, pepper became so important that it spurred spice trade and inspired Spanish exploration that led to the discovery of the New World. Black pepper is available whole, cracked (crushed) or ground. While ground is fine as a quick counter condiment, pepper's best flavor comes to play when you buy whole peppercorns and crack or grind them yourself just before adding to recipes. Whole peppercorns should be heavy, compact and free of blemishes. Store in an airtight glass container in a cool, dark, dry place. While whole peppercorns will keep almost indefinitely, ground pepper will only stay fresh for about three months. This versatile master spice can be added to almost any recipe. Drop whole peppercorns into simmering soups, stews and fruit compotes or add to meat, seafood and poultry when poaching. Use the side of a wide chef's knife to coarsely crack peppercorns and rub them onto steaks and chops before grilling. A pinch of finely ground pepper can add unique depth to desserts like spice cakes and gingerbread cookies. And when using a peppermill, remember coarser grinds are great when you really want the pepper flavor to be noticed. Think marinades, hearty meats or a thick, rich Caesar salad dressing.